The other day, when I had just finished off the work on the most recent print, and was slipping a copy into the cases that I keep in my workshop, I realized that it was the seventh one done so far this year. Seven already? But the exhibition was just the other month ... wasn't it? Where has the time gone? That is a phrase that I frequently hear from other people, but really haven't used much myself. Because my work is quite strictly paced, month by month, I really haven't had feelings that 'the time is going by quickly/slowly' as the case may be. The months just roll steadily by ... tick ... tick ... tick ... But somehow this year seems different ... Autumn already! Only a couple of months left! Time to get busy with the exhibition preparation, publicity, New Year's card, the printmaking classes I teach in Tokyo (tell you more about them later), 'Hyaku-nin Issho' winter edition, local 'culture day' printmaking workshops ... and ... seems like something I've forgotten ... oh yes, a few more prints to make! Although this little series is entitled 'Halifax to Hamura', it certainly hasn't been a direct trip from one place to the other! While preparing for this story, I tried to count up how many places our family has called 'home' over the years, but gave up at nearly 20 ... But of all these different moves, I think it was the first one that was probably the most important - the big step that my parents took when they left their home town. After getting married, they left behind their families, friends, and familiar places, and struck out on their own, moving from Halifax to the big city of London. 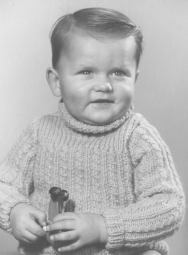 My father had been involved with music since he was a small boy, playing first the bugle, and later the saxophone. This was the time before television brought entertainment into people's homes, and it was the heyday of the 'big bands', with dance halls in every town up and down the length of England. Just as today's youngsters dream of playing guitar in famous rock bands, so did that generation dream of trumpets and saxophones ... Somehow he got the idea that making a career out of his music would be preferable to spending his life in a local factory, and he decided to give it a shot. He became successful quite quickly, landing a position playing baritone saxophone (and singing) with one of the best-known band leaders of the day - Oscar Rabin. Nowadays, we only remember the names of a few of the most famous bands of that era - Glenn Miller, Tommy Dorsey, etc., but at the time, there were many other groups no less famous, and the band my father was in was one of them. They made best-selling recordings, and played many radio programs, but the bread and butter of the band's life was the dances, for which they travelled endlessly back and forth across the country, playing for packed crowds night after night. Of course, I don't remember anything at all of these times, but I do know one thing, that from the moment I was born, right up until my brother came along to share the stage (and a sister, quite a bit later), I was the focus of family activity. She played with me, read to me, took me to the parks, to the museums, every day a round of activity. I am sure there was never any thought of putting me in a day-care centre while she went out to work. I was her work. Now this too, sounds quite similar to a Japanese pattern, a mother with her first young son, but there was one quite large difference. While the Japanese mother considers it her job to take care of her child, to protect it as much as possible, and do as much as possible for it, the English mother (in those days, at least), while of course taking care of her child, would also encourage it to do as much as possible for itself. The encouragement of independence comes very, very early. She has kept my 'report cards' from that school, and it is interesting for me to see the type of things we 'studied'. Of course there are the usual 'three R' type of things, but the list also includes things like elocution and boxing! I don't think there's much left in my character now from those subjects! Whenever I have a chance to visit the home of one of the collectors of my prints, it is always interesting for me to see how the prints are being stored. One person may have the cases all lined up on the bottom shelf of a bookcase, another will have them tucked away in a closet. It has been very surprising to me though, to see that many people have 'broken up' their print collection, either by giving prints to friends, or splitting them up among family members. Of course, it's none of my business what people do with their prints, but I do feel a bit sad that these 'children' of mine get separated from their 'families'. It was thus especially gratifying last year to hear that the library of Atomi Junior College here in Tokyo wished to add my work to their famous collection of Hyaku-nin Isshu materials. Here was a collector who wouldn't be breaking up the sets! 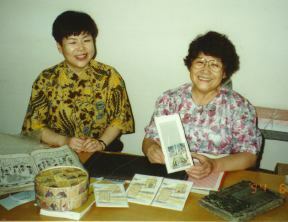 I first met Mieko Takahashi and Toshie Nagai, the two ladies who oversee the collection, at my exhibition in Shinjuku last year, and they have been enthusiastic collectors and correspondents ever since. The impressive collection under their care consists of more than 1700 various items related to the Hyaku-nin Isshu. Books represent the largest part, but are by no means all that they are keeping. When I visited recently to learn a little bit about their work, they proudly showed me a wide range of interesting materials: dolls, scrolls, of course 'karuta', letterpapers, and even things like handkerchiefs and senbei packaging, all decorated with Hyaku-nin Isshu motifs. One especially interesting item was a set of two 'chawan', on the inside surface of each of which, an artist had brushed the entire set of 100 poems with an extremely fine pen. The collection also contains many historically important items, including a book that is apparently the second-earliest reference to the Hyaku-nin Isshu now known to exist. 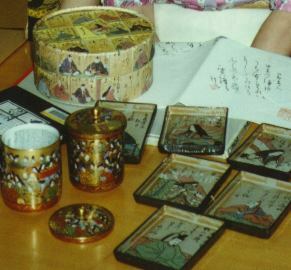 Scholars regularly make use of the collection materials for their study, and it was interesting to learn from the ladies during my visit that the long-held presumption that Fujiwara Teika was the original compiler of the Hyaku-nin Isshu has recently been confirmed as fact, with the discovery of some previously unknown manuscripts. To think that my print set is now month-by-month becoming part of such an illustrious collection gives me a great deal of pleasure, and it is a warming thought that centuries from now, scholars and others with an interest will be able to peruse my work there. (My prints are also going to the Toyo Bunko, where I first saw the Shunso book, and I'll be writing about them in a future issue ...). So thank you, Takahashi-san and Nakai-san, for being so interested in what I am doing. The two of you have put a very personal face on what could have been just an impersonal acquisition for an institutional collection. I look forward to years more communication with you. In the early 1600's, when Ieyasu, the founder of the Tokugawa dynasty, finally achieved his dream of becoming 'shogun', the grand military ruler of all Japan, he immediately started to set up an intricate and complex arrangement of rules designed to govern the behaviour of all inhabitants of the country. His motivation was very clear, the restriction of social mobility, the preservation of the status quo, and thus the prolongation of his (and his descendants) position as rulers of the nation for as long as possible. From quite some time before this, Japanese society had been stratified into horizontal layers, with everybody's position on the scale made very clear, from the figurehead status of the emperor at the top, down through nobility, warriors, farmers, artisans, merchants, and so on, right down to the absolute bottom, the outcasts, but this was now codified and set in concrete. Almost every possible aspect of life was regulated - what fabrics and patterns of clothing were permitted to each class, what types of house could be built, to what extent people could travel, communication with people of other classes, and of course what kind of daily activities were allowed. Ieyasu's prescription for maintaining power turned out to be extremely effective. For over two and a half centuries (1603-1868) his family reigned over the country, an enormously long time, especially when compared with the wars and chaos ravaging Europe during the same period. But rules were only rules, and reality was something different entirely. Although the concept worked very well for the first hundred years or so (at least from the Tokugawa family's point of view), it was impossible to 'stop the clock' completely in actual practice, and strains gradually appeared in the system. One of the biggest problems concerned money. The warrior class had traditionally been compensated for their services in rice, rather than with actual negotiable currency. The allotment of rice they received served to support their family and retainers, and this was adequate as long as they maintained an exclusively traditional lifestyle. But gradually arising in the cities, especially in Edo (old Tokyo), was a new lifestyle, one being led by a newly enriched merchant class, and in which money played an ever-increasing role. The men of this mercantile class were poor in status, standing very low in the social hierarchy, but were increasingly rich in actual cash, obtained through their manufacturing or trading activities. 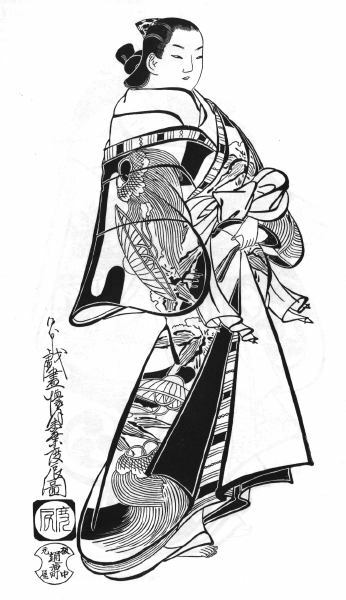 With increasing amounts of money on hand, and expanding amounts of leisure time available, it was inevitable that new forms of social activity would arise, and this period saw the development of two institutions that would help to transform large parts of society, and contribute greatly to the eventual breakup of the feudal class system; the kabuki theater and the 'Yoshiwara', the red-light district. Not coincidentally, the art that we now know as Ukiyo-e had a significant role to play in both of these. Although the origins of the kabuki theater lie many years before the Tokugawa era, it could not flower until these necessary circumstances arose. It became hugely popular, attracting not only townsmen and merchants, but also, much to the displeasure of the rulers, members of the samurai class. Woodblock prints played an important part in the life of the theater, not just as 'advertisements' for the actors and productions, but as an integral part of the experience of visiting the theater. In an era with no television or newspapers, they performed the essential function of disseminating the theatrical experience to an audience far wider than simply those people who attended the productions. The problem, from the point of view of the authorities, was that the plays invariably moved into areas where the subject matter was at variance with the 'official' line, and there was constant friction between the theaters and those wishing to proscribe their activities. 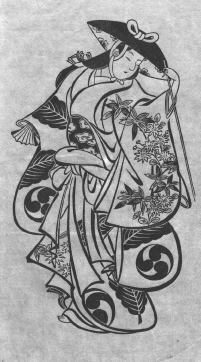 The woodblock prints were not excepted from these battles, and all designs had to obtain the censor's approval before production. Despite this pressure to conform, the prints continued to be a contributing factor to social change, and even such a famous designer as Utamaro spent a term imprisoned for producing material considered to be critical of the shogun. Although on a far more 'private' scale than the noisy theater, with most of its activities taking place in seclusion, the Yoshiwara was perhaps a more vital agent of social change. Sometimes referred to nowadays as the 'green houses', the brothels there provided far more than simple sexual services. They were places for townsmen to meet, to spend leisure time, to discuss affairs of the day, and of course to make romantic assignations. Unlike the image of similar European institutions of the time, where one can imagine revolution being plotted under the noses of the king's agents, the Edo townsmen were not concerned with overthrowing the government. But their pursuit of basically hedonistic activities, including poetry readings, discussions of recent novels, showing off recent acquisitions of new clothing or the like, served to undermine the stated goal of the regime to keep 'everyone in his place'. And ... they started to attract men from the warrior class. The major attraction at these places was obviously the women, and there was fierce competition between them for customers. No expense was spared when it came to clothing, hairdos, or other accessories. The fame of the women spread far and wide, and the status in society of those of the top rank can perhaps most easily be understood by comparison with someone like Marilyn Monroe, as a kind of dream figure - unreachable and untouchable by normal men. Only the most wealthy and favoured could ever hope to have a woman like this attend their affair in the tea house, and this was the nub of the problem for the authorities. When status in society started to be measured by the prestige of the courtesan one could buy, rather than by one's birthright and place in the heirarchy, the end of the feudal society was in sight. Of course, for the masses at large, who could never hope to even catch a glimpse of these famous courtesans, the prints would have to suffice. They were run off in the thousands, and were eagerly snapped up by the Edo populace. The effect on society of these images was immense, just as that of Monroe has been over the past few decades in our time. 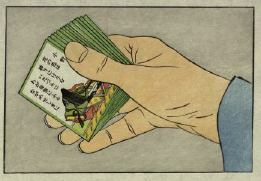 Remember again, there were no newspapers, magazines, movies, photographs ... All the power of all of our varied media were concentrated in one single outlet - woodblock prints. These women and their tea-house environment were thus a major driving force in the shaping of late Edo-era thinking. The battle raged back and forth over the years, the government coming out with a constant stream of regulations to try and maintain the power of the regime - rules about permitted colours on clothing, what hairstyles were allowed, what plays could be performed, and what books could be read ... but always the townsmen found new ways to express their desire for a different kind of life, and looked to the Ukiyo-e for guidance. What it was they were looking for they could perhaps not have even described, but they knew they were not willing to accept the status quo. When the outside world finally came knocking on Japan's door in the mid-1800's, the preparatory work had been done. The feudal society, so outwardly strong and solid, was hollow at the core. It collapsed in chaos, and a new society arose in its place. It is impossible to overestimate the role that Ukiyo-e prints played in this long process of change. The prints were everywhere in society. Members of a poetry circle meeting at a tea-house would have their best work engraved and printed for circulation, perhaps accompanied by a design from Suzuki Harunobu, who specialized in such work. The townsman's wife would eagerly peruse the latest prints in a book shop, looking for information on the latest fashions and hair styles. Sumo wrestlers, historical heroes, folk tale figures, all figured widely in the prints. It is hard to find any aspect of the culture of the day that was not included. The prints were as representative of their society as any stack of magazines in our local bookstore is of ours now. And just as we consider 'Focus' magazine to be anything but high art, the people of that day would never have thought of their prints as anything special. The men who created them were simple 'shokunin' or workmen, and even the designers, who we now consider to be among the world's greatest artists, had a social status ranking far, far below such people as calligraphers or painters in antique Chinese styles. Ukiyo-e prints were not 'art', they were 'commerce'. They were not pretentious works, but simple honest expressions of the culture of the day, shaped by that culture, and in turn helping to shape it. They were a vital force for social change, as revolutionary as any political pamphlets could have been. If they had not existed, the course of Japanese history would have been vastly different. Any single print of a beautiful courtesan could not cause the overthrow of the feudal society, but the Ukiyo-e as a whole certainly played a major role, and that is perhaps the highest possible accolade that can be paid to any genre of art. It is certainly fitting that these prints have finally, in our century, found the respect and understanding that they did not get in their original society. May they stand forever as symbols of the power of art to change the world. Since earlier this year, I have been contributing occasional things to the 'Mainichi Weekly' newspaper, and for some time now they have been using little essays that I write for their front page, about once every month or so. This is great fun for me, finally getting a chance to write about things other than printmaking! (It is a very well produced, absorbing little newspaper, and if you have any interest in English at all, I think you should try it.) Wow! I never thought I'd see advertising in my 'Hyakunin Issho'! I hope you weren't too disappointed that I didn't have a 'craftsman' story in this issue, but replaced it with a history lesson! To me anyway, things like this are quite interesting, and I am sorry that I could talk to you about only one aspect of the long and involved story of Japanese prints. There are so many interesting stories to tell! But I've got to be careful not to stray too far from my workbenches ... Time to put away the word processor. Back to work!